Walking with Jesus: Day 41: Matthew 17:14-27 & Psalm 41 - Is It True that "Nothing is Impossible" for Those Who Believe? Day 41: Matthew 17:14-27 & Psalm 41 - Is It True that "Nothing is Impossible" for Those Who Believe? Is It True that "Nothing is Impossible" for Those Who Believe? Many of Jesus' teachings have been misunderstood and mis-applied over the years. This is one of them. Is Jesus saying here that, with enough faith, we can literally do anything? In other words, if we just believe truly and sincerely, then can we have a million dollars or be cured of any illness or have any situation we face work out in our favor? Is that what Jesus us saying? No! 1. True faith is trusting in the promises of God, believing in God's Word. In other words, faith is always framed by revelation. It goes as far as God's word goes and no farther. 2. The content here is that Jesus had given His disciples power over demons, to cast them out. In this context, then, we can see that they should have trusted and, if they had truly believed, they would have seen the right result. Neither a biblical understanding of faith nor a clear understanding of the context would lead us to think that we can ask God for things He has not promised and receive them, if only we have enough faith. We cannot take isolated verses out of context and claim that they are promises of God for us, either. We need to trust in what God has said in the totality of Scripture. 1. How often do we struggle with shame and sorrow because we do not trust God's promises of forgiveness? 2. How often do we struggle with insecurity and fear because we do not trust His promises of love and His wise governing of all things? 3. How often do we fail to tithe and give sacrificially because we doubt His promises of provision? 4. How often does the church fail in missions because we doubt the power of the Gospel? God's Word is true and His promises are sure. We must believe, and if we will, we will see God do great things for His glory and the cause of His Gospel in our lives and in the world. Mountains will move, according to His word - mountains of shame, of doubt, of fear, of opposition to the Gospel. If we believe, we will see. "Blessed is the one who considers the poor! in his illness you restore him to full health." May I know this blessedness by remembering the poor. Give me a heart and a mindfulness toward those poor, that I may seek to bless, provide and serve then, as You give me opportunity to do so. I see and acknowledge my sins against You, Lord. Have mercy and be gracious to me for my lack of gratitude, my discontent, the grumblings of my spirit, my pride and arrogance, my foolishness. 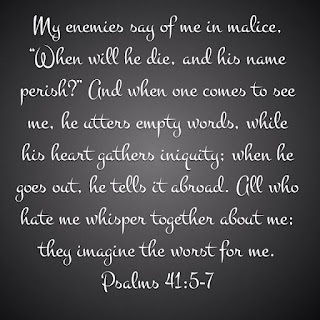 Father, rescue me out of the hands of my enemies and let them not triumph over me in my sin. Father, I see here the betrayal that Christ faced, the betrayal of a close friend. Thank You that He was willing to be betrayed for me and that You answered His prayer and raised Him up again, victorious over sin and death! In His victory, I have salvation! Father, because Christ sits at Your right hand, I have an eternal advocate with You. 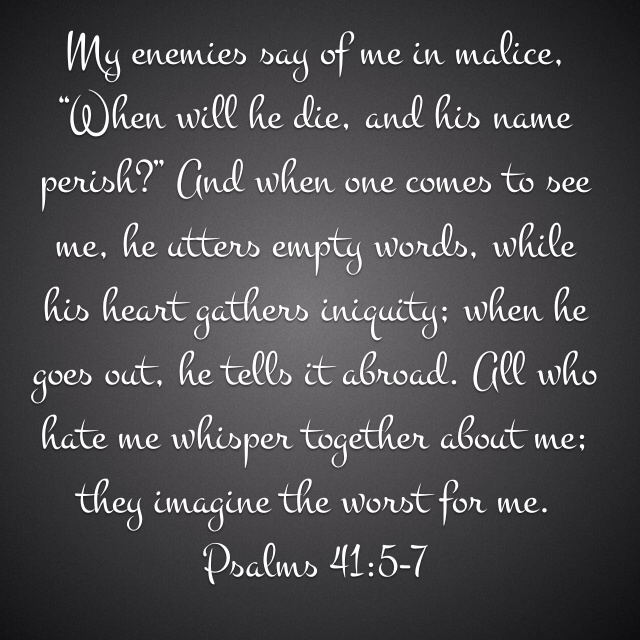 You have given Him victory over His enemies, and You have given me the same through Him. I praise You for such great salvation!